I know I must sound like a broken record, but please pardon my lack of activity here (again). But this time, I think I have a pretty good reason. I am happy to announce that I have a book coming out on April 15, 2017. It’s not Distilled History in book form (baby steps), but it was this blog that prompted a publisher to reach out and ask if I’d like to take on a special project. 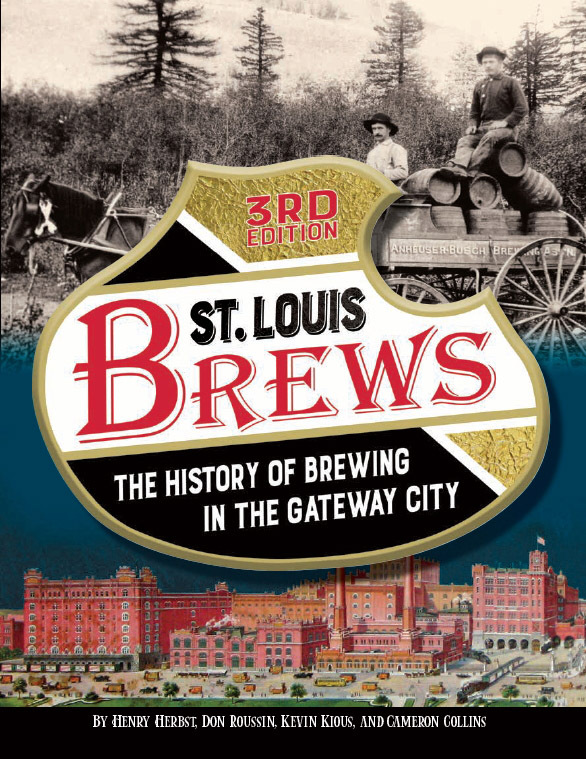 The book is titled Lost Treasures of St. Louis, and it’s a fun look back at many of the restaurants, amusement parks, movie theaters, and other St. Louis memories that are no longer with us. The project took hundreds of hours of my life over the span of eighteen months, and I simply couldn’t keep Distilled History going at the same time. Now that it’s done, I plan to get back to blogging here as much as I can. In the meantime, pre-orders are now available at the “Store” link at the top of the page. Anyway, I’m excited to get back to the great stories (and watering holes) St. Louis has to offer. And now that the entire archives of the St. Louis Post-Dispatch are available online (with a subscription), finding a good story has become immeasurably easier. I still love listening the whir of microfiche machines at the Central Library, but it’s so convenient to get your history fix from a home computer. And while doing that last summer, I found something interesting. I can’t remember what I was looking for, but I forgot it as soon as my eyes landed on a 1949 article with the word “snorkel” in the title (the firefighting “snorkel”, not the thing that lets you breath under water). And seeing the debut of the snorkel in St. Louis made me think a particular fire in which a snorkel would have come in handy. That’s the Southern Hotel fire of April 11, 1877, a fire I know well since my pal at the Campbell House Museum (Robert Campbell) owned the hotel at the time. The Southern Hotel fire was a devastating event in the city’s history. Along with the complete destruction of the city’s most elegant and magnificent hotel, more than twenty people lost their lives. And many of them died because they were simply out of reach. But the snorkel article also made me think of a particular firefighter who was a major participant in the events of that fateful night. I have always wanted to learn more about him because his story always sounded too good to be true. His name is Phelim O’Toole, and it turns out it his story really is that good. In the spring of 1877, Phelim O’Toole was a captain of Hook & Ladder No. 3 in the St. Louis Fire Department. Born in County Wicklow, Phelim O’Toole worked as a sailor before coming to America in the 1860’s. He turned twenty-nine just a few days before he arrived on the scene that night. A member of the St. Louis Fire Department since 1872, O’Toole already had a reputation as one of the bravest men in the department. But on the night of April 11, 1877, Phelim O’Toole became the stuff of legend. I’ll get to telling O’Toole’s amazing story in a bit, but I have to stop and make sure the other guys who helped him that night also get the credit they deserve. As I started to dig into what happened on that horrible night 140 years ago, it became clear to me that the response of the St. Louis Fire Department was probably the only thing that went right. Another firefighter named Mike Hester deserves as much recognition as O’Toole (and he did get it at the time), but I’m going to focus on O’Toole for now. I have started researching Hester’s heroics as well, and my plan is to tell his story in a future post. I should also mention that this post was meant to be published in conjunction with the post I wrote about the Southern Hotel last summer. I recommend going back and reading that one first. It will provide a good backdrop for what Phelim O’Toole was dealing with that night. Even better, here’s a short video I put together featuring some great images and a waltz composed in honor of the hotel. The events that unfolded in the early hours of April 11, 1877 probably began in a storeroom in the basement of the Southern Hotel. The exact cause was never determined, but as Arlen Ross Dykstra details in an article in the Missouri History Museum’s Gateway Heritage magazine in 1986, there was “no lack of combustible material” in the hotel’s basement. Dykstra points out a variety of fire hazards, including a large pile of hair (for use in mattresses), the hotel’s gas supply meter, and a baggage elevator described as “wooden and oil-soaked”. And it was this elevator that caused the night to take a very deadly turn. As the fire reached the wooden elevator shaft, the fire was sucked to the top floors of the hotel almost immediately. As the fire quickly spread to the hotel’s upper hallways, the 500-room Southern Hotel began to burn up from the basement and down from the top floors at the same exact time. By the time hotel employees became aware of the situation unfolding around them, the fire was already out of control. Although men such as Charles Shephard, one of the hotel proprietors, and George Ford, the night clerk, sprung into action as soon as the fire was discovered, it wasn’t enough. Already undermanned due to the late hour, hotel employees failed to adequately warn hotel guests, the key to the city fire alarm telegraph box couldn’t be found, and heat-sensing mechanical alarms didn’t activate (the sensors were turned up too high by employees frustrated with false alarms). Furthermore, the flaming elevator shaft was located next to the hotel’s primary staircase. Before many guests were aware of their predicament, the hotel’s primary route for escape was already lost. As hotel employees abandoned efforts to extinguish the spreading fire and fled, most of the estimated 650 guests, residents, and employees located on the hotel’s lower floors had been alerted and were able to escape without much difficulty. One of them was Joseph Pulitzer, a resident of the hotel who occupied two rooms on the third floor. According to the St. Louis Globe Democrat, Pulitzer didn’t even bother getting dressed, and escaped “sans shirt, stockings, or anything else”. But to anyone watching the night unfold, it was clear that the critical scenes would play out on the hotel’s upper floors. As the streets around the hotel filled with hundreds who had escaped and thousands more who came to watch, the pleas of those trapped rained down from windows high above. The chaos caused by a fire of this magnitude is hard to underestimate. The Southern’s chief engineer, J. E. Russell, told the St. Louis Globe-Democrat two days after the fire that he was rousted from his fifth floor room shortly after 1:00 a.m. by the sounds of women shrieking. Finding smoke seeping through the transom above his door, Russell fled his room and immediately tripped over a woman laying prone in the hallway, screaming for help and crawling frantically for a path to safety. Dropping to the floor to catch his breath, Russell found himself crawling over more than a dozen people screaming for help. Russell reported that he did his best to lead people to safety, eventually reaching the servants wing where he found many of them in a “state of panic” and “running wildly about”. Finally, approximately twenty minutes after the fire started, the first alarm was pulled at 1:30 a.m. from a Fourth Street alarm box. Within minutes, fire carts arrived on the scene. After two additional alarms (1:45 a.m and 2:00 a.m), every fire department in the city was involved except one. Upon arrival, firefighters quickly determined the building was doomed. With the hotel’s interior made almost entirely of wood (including the duct system), and rooms lavishly decorated with flammable carpets and drapes, the fire raged unchecked from within. As firefighters rushed into the hotel’s main entrance, they found the floors and ceilings on the verge of collapse. Rushing back outside, it was clear that all emergency efforts would proceed on the hotel’s exterior only. The fire department then turned their attention to saving lives and preventing the fire from spreading to other buildings. Other than the inferno itself, the biggest problem facing the fire department was the inability to reach those trapped on the hotel’s upper floors. While some extra height was provided by positioning ladders on top of porticos and on top of Tony Faust’s restaurant next door, many remained out of reach to ladders that could reach no higher than the hotel’s third floor. This reality of the situation forced many to take drastic action. Kate Reilly, a hotel employee with no means of escape from her fifth-floor room, jumped from her window rather than be consumed by fire. She died instantly. Adolph Einstmann, using a makeshift rope fashioned by tying bed sheets together, attempted to scale down the exterior of the building. With his wife and mother-in-law watching from above, Einstmann made it about halfway down before the rope slipped. Before hitting the ground, he was gored by a hook mounted on the outside of the hotel. With no option but to follow, Einstmann’s wife and mother-in-law descended the rope after him. While his wife was able to reach the ground safely, her mother did not. Critically injured by the fall, she died the next day. Another man named G. Frank Gouley initially found a path to safety, but then made the tragic decision to return to his room to retrieve a cherished photograph. The fire sealed him in this time, and Gouley was forced to jump from his fourth floor window. He died moments after hitting the ground. Another man named Sidmore Hayden was one of the fortunate to have a ladder reach his window. But while climbing on, Hayden lost his footing as he attempted to step upon the top top rung. Death found him on the balcony below. The St. Louis Globe Democrat reported in the days after the fire that at least twelve people died falling or throwing themselves from the hotel. And what may have been the most heartbreaking turn of events, a member of the British House of Commons named Lord William Felix Munster became separated from his wife of eight months while fleeing from the fire. Reaching safety, Munster learned that his wife did not make it out alive. In a fit of despair, Munster produced a revolver and fired a bullet into his head. Tragically, it was discovered hours later that his wife had in fact survived. But a glimmer of hope was restored when a special truck known as a “Skinner escape” arrived on the scene. Drawn by horses, a Skinner escape was an early form of today’s aerial ladders, and its hand-cranked extension ladder provided the best hope for those who remained out of reach. Phelim O’Toole was the truck’s foreman (a term used for “Captain” at the time) and what happened next must have been quite a sight for the thousands of people on hand to see it. After arriving and “making better time to the fire than we usually do” as O’Toole reported in his own journals, O’Toole’s Skinner escape made its first stop in front of the hotel’s main entrance on Walnut Street. With no sign of anyone in the windows above, the truck was then moved to the 4th Street side. With several identified on this side, the order was given order to stop and raise the ladder. But Skinner escapes were cumbersome vehicles, and getting a good position on the ground proved almost impossible with obstacles such as the hotel’s porch and double-car tracks in the street. As a result, when Phelim O’Toole eventually reached the top of the ladder, he found himself five feet short and five feet back from the fifth floor window (with four people inside) that he was trying to reach. Realizing he wasn’t able to effectively throw the rope he brought with him, O’Toole shouted for someone to pass him a bed sheet. With assurances that “I’ll save your lives”, O’Toole was able to grasp one end of a sheet thrown by a Washington University professor named Reese. With the other end tied to a bed inside the hotel room, O’Toole twisted the sheet and then swung himself off the ladder. Dangling fifty feet above the ground, and with a remarkable faith in an English professor’s knot-tying skills, O’Toole climbed hand-over-hand up the side of the hotel and into the burning hotel room. Reese and his family must have been amazed by the feat, but there was no time for admiration. Almost immediately, O’Toole had his rope around Reese and ordered him out the window. It wasn’t possible to lower Reese to the top of the ladder (which remained five feet back from the wall), so O’Toole ingeniously made Reese a part of his rescue effort. Lowering him to a position on a wider widow sill below, O’Toole brought the rope back up. As Reese’s wife was lowered next and came within her husband’s reach, O’Toole instructed the professor to shove her out to the ladder. As Reese did this, another firefighter stationed at the top of the ladder was able to grasp the woman and pull her to safety. And this was all done in the midst of a treacherous fire. After saving several others on the Fourth Street side in a similar manner (with a few lowered completely down, bypassing a shove from Professor Reese), the Skinner escape was moved again. On the Elm Street side, a man named Charles Kennedy was spotted outside his fourth floor window. As Kennedy repeatedly announced that he was about to jump, O’Toole climbed the ladder again, threw Kennedy a rope, and shouted “No, damn it, don’t jump.” Then O’Toole ordered Kennedy to turn around (facing the window) and hang his legs over while clutching the window sill. O’Toole reached up and fastened his arms around Kennedy’s legs like a vise. Holding tight, he shouted for Kennedy to “Drop!”. Kennedy let go, and after a bit of a struggle, was soon secured at the top of the ladder. Charles Kennedy was the last to be saved by Phelim O’Toole that night, and it happened just moments before the entire Fourth Street side of the hotel fell. In the end, it’s believed Phelim O’Toole was responsible for saving the lives of at least twelve people. It could have been more, but much remains unknown about that tragic night. In fact, the number of people who died in the Southern Hotel fire has never been precisely determined. The hotel’s guest book was destroyed in the blaze, and newspaper accounts had numbers varying from fourteen to more than thirty. Two days after the fire, the St. Louis Dispatch attempted to calculate the number of people unaccounted for, and the number reached was thirty-eight. However, bodies were still being pulled from the rubble, and the article admits that some survivors may have simply left town. As for Phelim O’Toole, his heroics brought him celebrity and instant fame throughout St. Louis. Awarded with a gold medallion, a substantial monetary reward (which he promptly donated to charity), and musical performances held in his honor, Phelim O’Toole became the toast of the city. He even had a song written about him. And even today, Phelim O’Toole is remembered as one of the bravest and most revered firefighters in St. Louis history. Walk into the St. Louis Fire Department’s headquarters on Jefferson Avenue, and his portrait can be seen prominently displayed in the lobby. Sadly, Phelim O’Toole’s career was cut short just three years after his heroics at the Southern Hotel. In July 1880, O’Toole was responding to a small fire in a vacant house on Locust Street when a fire extinguisher blew up in his hands. He was killed by the blast. Two days later, as many as 20,000 people lined the streets to pay their respects during Phelim O’Toole’s funeral cortege. Beginning at a firehouse, O’Toole was carried by a Skinner escape to the (Old) Cathedral. After the memorial service and being transferred to a hearse, more than 100 carriages and 70 buggies followed Phelim O’Toole to his final resting place in Calvary Cemetery. While writing this post, I decided to reach out to the people who probably knew Phelim O’Toole as well as anybody, the St. Louis Fire Department. Phelim O’Toole is an important figure in the department’s history, and I wanted to make sure I had my facts straight. So, not long after I knocked on the front door of the department’s headquarters and asked if anyone could help, a captain from Engine House No 1. named Michael Corson reached out to me. It took me a while to get back to him (pesky book project), but we eventually met and shared information about the history of fighting fires in St. Louis and its most famous firefighter. It was a great experience, and I’m grateful for his and the St. Louis Fire Department’s help. Finally, I couldn’t think of a more appropriate neighborhood in which to toast Phelim O’Toole than Dogtown. It’s not Kerry Patch, the long-gone Irish neighborhood O’Toole called home 150 years ago, but Dogtown is an Irish as St. Louis gets today. I lived in Dogtown for several years when I first moved to St. Louis, and I have many fond memories of walking just a couple hundred feet from my front door and ordering a pint of Guinness at Pat’s (now the Pat Connolly Tavern). I have a special project in mind for the Pat Connolly Tavern, so for this post I decided to cozy up to the bar at the other Irish bar in Dogtown, Seamus McDaniel’s. I ordered a pint of Guinness, and while getting a good pour from one of the nicest bartenders around, I raised my glass to Phelim O’Toole and toasted to one of the bravest men in the history of St. Louis. I really enjoyed this post. I love the history of St. Louis. Thanks for returning to your blog you have been missed. Thank you so much! Your comment made my day. Well written account and you are correct he would have preferred the whiskey! Please tell me you are a descendant of Phelim O’Toole. That would make my day!